Lean Thinking: The Power of Doodles! Why doodle? Why draw images of problems, of notes, of ideas, of meetings? There are a couple of main reasons, namely to remember your thoughts or what happened and to communicate your thoughts or what happened. Doodles take your thoughts and translate them into pictures. These pictures have a much deeper meaning than just words. They convey a context that words can’t match, after all a picture is worth a thousand words. 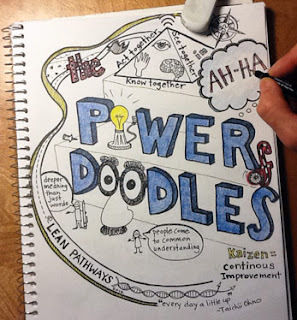 Doodles help people come to a common understanding before action occurs. This way the action can be laser focussed on the problem rather than being scattered. So why don’t more people doodle in meetings, why do people keep notes in a word form? I think it’s because people quite simply, don’t believe they can draw and fear the judgement of their peers. So the safe route is to take and publish notes in a word format. Lately, I’ve been fascinated by the social media called Pinterest. It’s a wonderful idea that is catching on like wildfire. It’s based on posting images, pictures or doodles of things you are interested in. What’s even better is that you can collaborate with people on a team picture board and use it to plan events, projects, kaizen, and team improvements. It eliminates the biggest objection people have to doodles by providing a safe, fun environment that is relaxed, comfortable and playful. You’ll find this type of environment is great for idea generation as the embarassment factor has been lifted. This makes it good for brainstorming, Design, kaizen, and problem solving. If you’re interested, please see Lean Pathways on Pinterest for more details.